Elaine Sexton: You’ve described your process of applying paint to canvas as more “splat” and “whack” than the less forceful “drip” one might assume. At one point in your work you shifted from the more conventional use of a brush to wacking the canvas with paint. Would you share the story of how this came about, and your thoughts on process? Ro Lohin: Preferred mark making has a lot to do with an artist’s temperament. Since I first began painting I was not very good at representing things in painting. I was more inclined to find things, mark by mark or moment by moment. I have always worked from perception to ignite my imagination. I looked at Cezanne and Bonnard and early Matisse and Seurat, “French” colors and modernist style, modernist in the approach that each moment or mark was built on the previous one, like a call and response activity with the canvas. I thought painting had that in it. I mean when a painting comes to completion I wanted the stuff that “rolls through all things” to be what my paintings had. Bonnard’s optical “pulse” moved me very much. 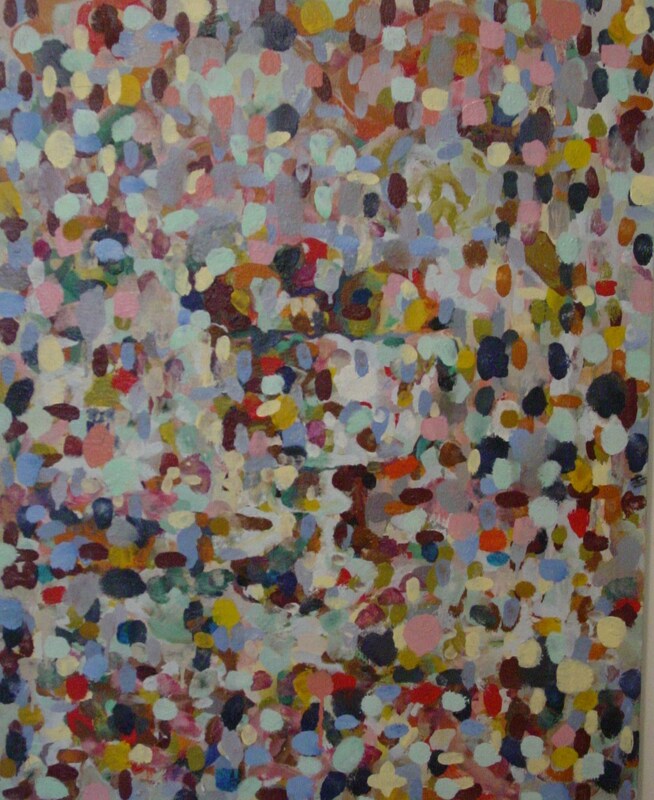 Although his work is not exactly perceptual, the living magic of dots and touches of color were an inspiration to me. I began many years of painting from a still life, working mark by mark. The marks were drawing marks and marks of a certain pulse of color and light. I noticed the marks changed character from time to time – light touch, no drip, blob, swatted blob, blob with drip – eventually a controlled dot of chromatic color. This carried over to landscapes, but I began to scribble with the brush, always drawing and trying to make relationships that were what I was seeing. This scribble didn’t drip. Goblet, 24 x 29” oil on canvas, 2000. 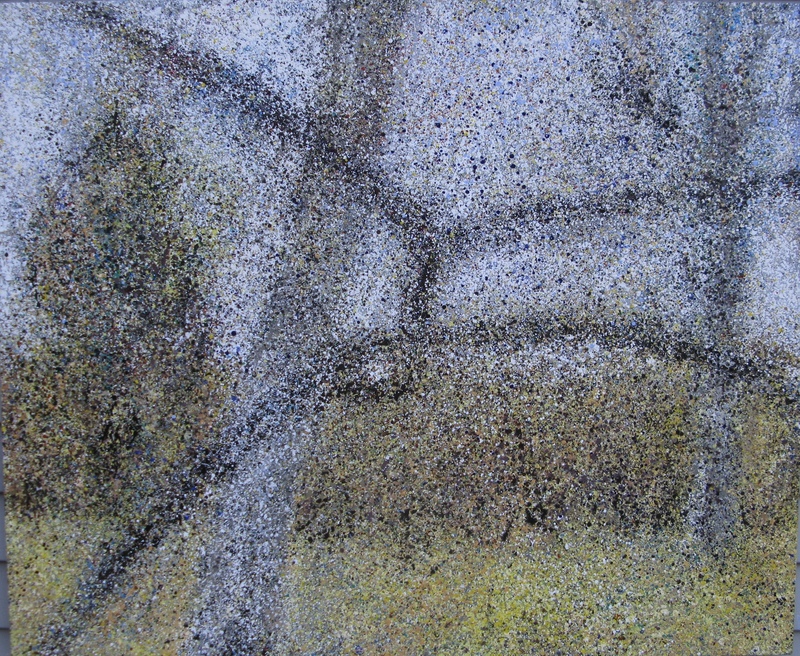 I like painting outdoors, where the possibility of “micro to macro” is available. 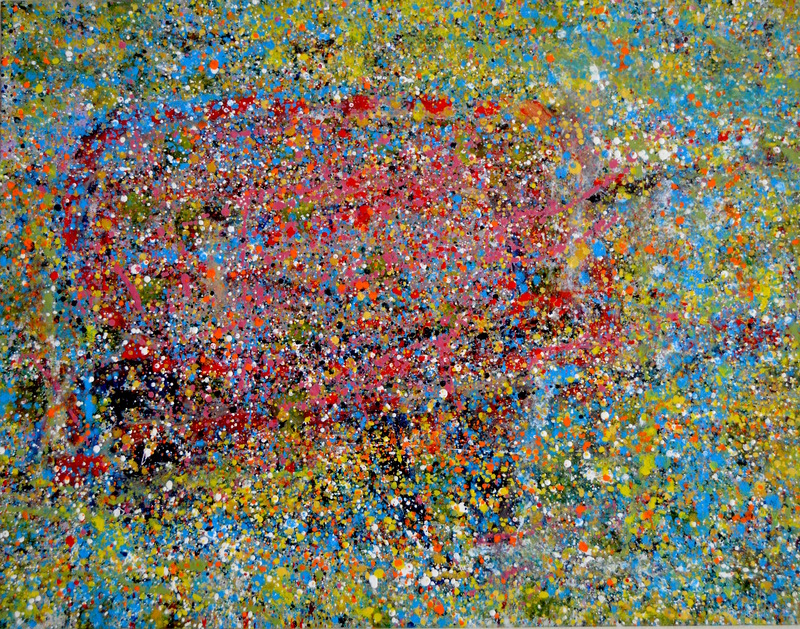 I like that “infinity” is an available plane (meaning the sky) and also the particle of paint. 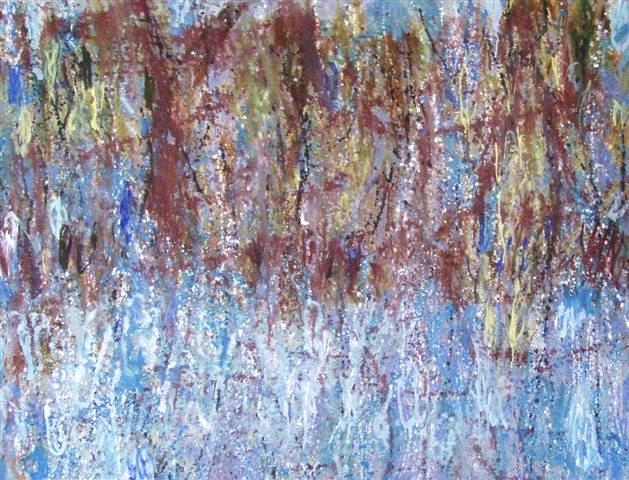 Once, in the winter of 2012, while I was painting, all bundled up, it began to snow. It was a very heavy, wet snow and my paint began to slide downward. I had always painted on an easel. At that time I was using the controlled scribble. For some reason I laid the painting on the ground and thought: if I worked fast enough I might finish the piece. Working rapidly I mixed larger batches of paint and continued to paint, drawing in my painting with a swat. And it felt good to do that. This seemed to unleash a strong yet haphazard energy within. Close to anger, or rage. From that one painting I began to paint flat on the ground. It was liberating not to have to control things right from the beginning. I could work and rework areas, building with a loaded brush of color, from all sides of the canvas. This opened up everything to me. I am now painting the stuff of things through a drawing swat and making fields of color. This allows me to access unconscious imagery from time to time. The technique is very open on some levels, and yet very exacting on others. ES: Your keen interest in poetry is also evident in your sequence of paintings, “Red Wheelbarrow,” based on the William Carlos Williams’ poem. Tell us about that. RL: When I am painting, looking hard, I am very much in the moment. A jingle from a tv commercial from childhood will clash with a good line from a poem or a color or the feeling I get when outside under the infinite sky. In my mind, things loosen and cohere – the deep past – the present seem to have a clear connection. I can process experience. It is an exhilarating place to be in one’s head, yet it only happens when I am entrenched in looking at what is in front of me. To me, the essence of the poem “The Red Wheelbarrow” is about reality being right where you are, in the still and present. 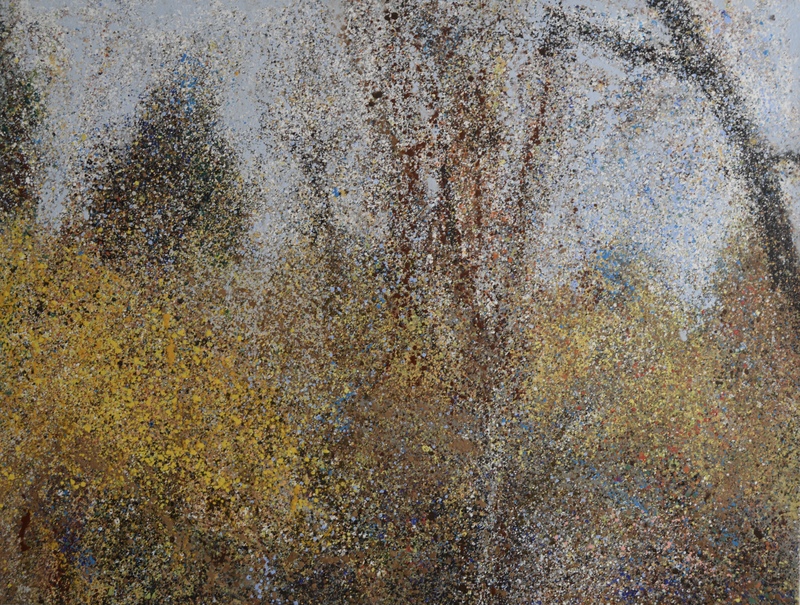 Ro Lohin’s work has been exhibited internationally. She has been awarded artist residencies at the Josef and Anni Albers Foundation, the Vermont Studio Center and the Cite Internationale des Arts, Paris. She paints, on site, on the North Fork of Long Island, and Mexico’s Yucatan Peninsula. Lohin has taught drawing at the New York Studio School, the School of Art and Design at Alfred University, Western Carolina University, and the Chautauqua Institution. She is the former owner and director of the Lohin Geduld Gallery in New York City.